Getting a visa on entry to Cambodia from Vietnam at one of the international border crossings is straightforward. It’s also possible to arrange an e-visa in advance if you are entering through either airport or certain land crossings: from Vietnam the only land crossing where e-visa is supported is Bavet (Svay Rieng). 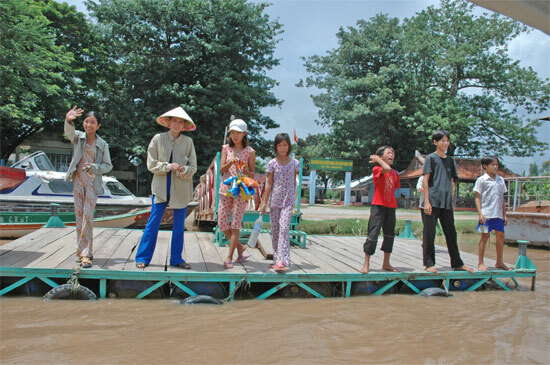 It’s a long boat trip from Hanoi to Cambodia, but the money-changers will greet you all the same. However, if you prefer to arrange everything in person in advance, it’s also very simple to do at the Cambodian Embassy in Hanoi. The Embassy is based at 71 Tran Hung Dao Street — you will see number 71 on the main road, turn the corner onto Quang Trung Street and the entrance is about 100 metres down on the right. It’s about a 2km walk from the centre of Old Quarter, less than 1km south of Hoan Kiem lake. The visa office is open from 08:30 to 11:00 and 14:00 to 17:00 Monday to Friday. Forms can be found on the table outside of the office and applications are taken inside. It’s a strange set-up: a person sitting behind a heavy wooden desk, piled high with papers — quite different to the usual glass screen arrangement. The person on duty when I went along was very chatty — his English actually wasn’t too great (he didn’t understand all of my questions) but he had learned the “Why go to Cambodia now!” spiel by heart and almost made me consider a trip.